Musicians: Vanessa Paloma, Fella Oudane, Fettah Abbou, Romeo Guzman. Jewish	Community	Federation of Chattanooga and Islamic Education & Services Institute co-host Drinking From the Same Well. 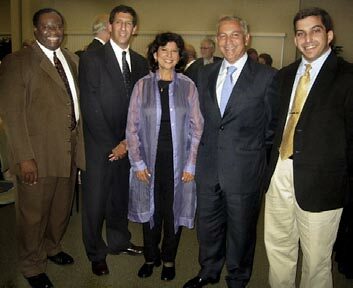 Pictured: Councilman Yusuf Hakeem, Michael Dzik, Rose-Lynn Fisher, Moroccan Ambassador H.E. Aziz Mekouar, and Abdou Kattih at opening. Not in photo but also present, Sir Charles Dahan. In conjunction with 2003 theme year "Fostering Dialogue"